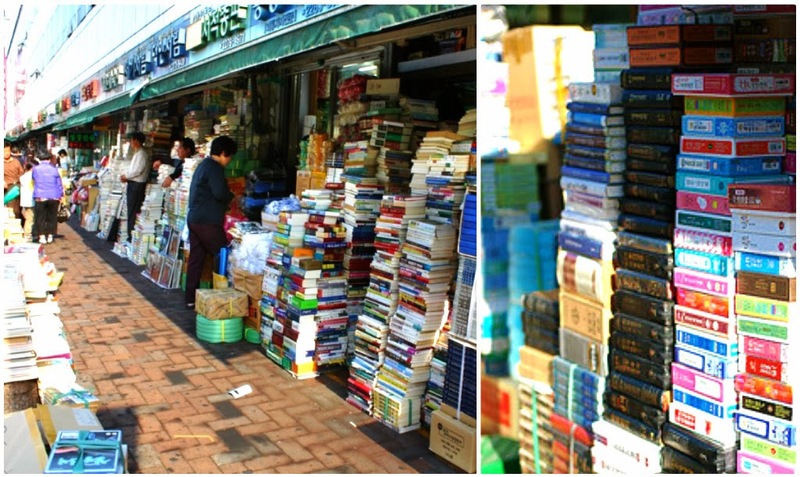 Located on the ground floor of Pyeonghwa (Peace) Market sits a hidden jewel, the second-hand book street. Growing steadily since the 1960’s, many collectors travel from afar in order to find limited editions and rare book to satisfy their treasure hunting needs. Having been around for over 40 years, used books have accumulated and crowded the small stores. Books are piled from floor to ceiling, wall to wall, emulating the history of each book. The used bookstores sell all sorts of publications including novels, essays, art and photography, poetry, magazines, foreign language titles and hard-to-find books, all at 30-40 percent off normal retail prices. Shoppers can easily spend hours just looking at titles here until an entire day has gone by! The second-hand book street is a rare sight to see. Visit this charming alley full of history! Directions: Take subway lines number 1 or 4 to Dongdaemun Station, then use exit no. 8. Then walk about 7 minutes towards the Dongdaemun Doosan Tower (DOOTA). This is my first time go to see at here and i am genuinely pleasant to read everything at one place. If you are looking for antiquarian books online then Collectible Cat is one of the best place for it.